If you’re a person that follows their passion, then you know the task of gaining new opportunities to exhibit that passion can be daunting at times. It’s a continuous and ongoing effort to show the world what it is you LOVE to do. With that point in mind, it’s even more important to never stop striving to keep at your craft and show all those that will observe your passion. Point in case: Since 2010, I’ve experienced having my literary work either accepted into other literary publications or publishing my work either through my own previous publishing company, blogs, or screenwriting. During the last four years, I’ve also had plenty of downtime where nothing was being viewed by the masses. That downtime was either by force or choice, but in either instance it has existed. And in between the downtime I’ve enjoyed several rewarding moments as mentioned above. The last few months, I haven’t done much related to my literary work outside of editing my next book (busy nurturing my daughter’s talents). But a few months ago, lo and behold, I was asked to have my work published in an up and coming print magazine. How did the opportunity present itself? The publisher ran across some of my previous work. I’ve never been solicited for my work, yet I always had to go after opportunities. 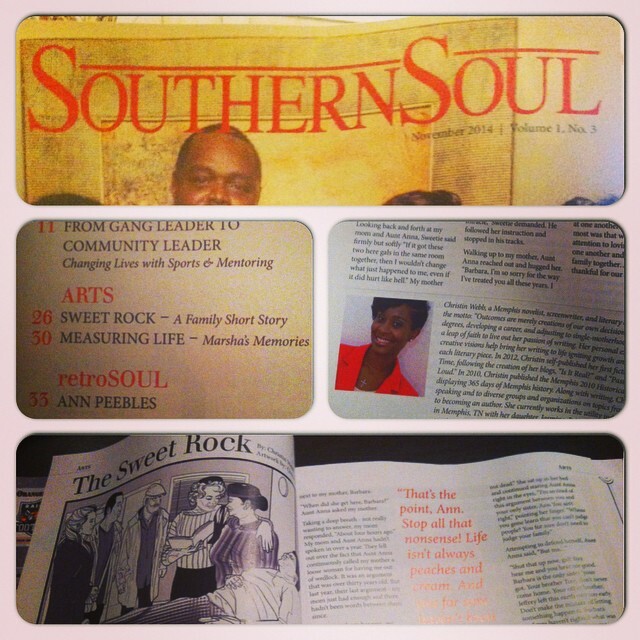 Today, I saw the fruit of that new business relationship and my short story, “The Sweet Rock”, was published in the awesome magazine, Southern Soul. I celebrate today and am proud to continue building my literary resume. The point is, the work I’d done in the past became my reward and fruit for today! If I hadn’t planted all the other seeds previously, there would be no celebration today. Don’t let the downtime in your life signify that nothing is happening. Something is always brewing as long as you’re positive and remaining true and diligent at what your passion is. Remain steadfast in your efforts. If you have aspirations to have your passion observed on a larger scale, continue gnawing at creating new networks and opportunities for yourself. Tomorrow can very well be another new day to celebrate!